THE water has always been a big part of Mathew Reynolds life - fisherman, charter operator, diver, water sports, movie shoots and skippering million-dollar cruisers. But after the Sydney Harbour boat tragedy that killed six of his friends on May 1, the 31-year-old has revealed he will never return to the water again. Mr Reynolds, whose father Charlie is a charter boat operator at Tweed Heads, said yesterday: "I am sorry for the loss we have all been put through." The veteran skipper with a clean maritime record was a passenger and not at the helm of the runabout on the tragic night. He hit back at claims that with 14 people on board a boat licensed to carry eight, it was on a joy ride. "The night in relation to the accident was not a party cruise, we were not out lairising," said Mr Reynolds, who has appeared in maritime safety ads in Queensland. 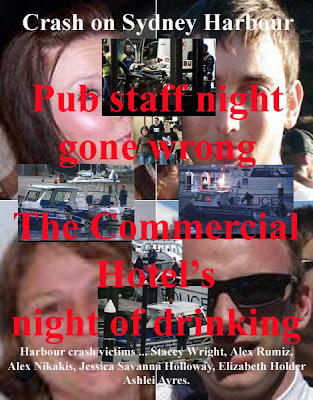 He said they were on the Harbour to drop off keys and paper work from the staff at Balmain's Commercial Hotel. Mr Reynolds' girlfriend, mother-of-two Ashlie Ayres, was among those killed in the accident. Also killed were Lizzie Holder, Stacey Wright, Savannah Holloway, Alex Nikakis and Alex Rumiz. Police last month sent a brief of evidence on the accident to the Director of Public Prosecutions.